Chaim and Liora Silberstein, the parents of Shira Ish-Ron, the young mother injured critically in Sunday night’s shooting attack at the Ofra Junction in Samaria, confirmed on Monday night that her condition is improving. 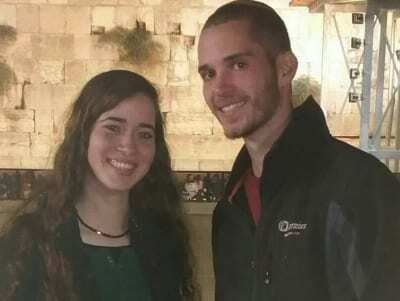 The wounded woman, Shira Yael Ish-Ran and her husband, Amichai Yishai Ish-Ran. Ish-Ron, who’s baby was delivered at 30 weeks during emergency surgery, remains in intensive care, but opened her eyes, her father told reporters at Shaare Zedek Hospital. Her husband Amichai was injured during the attack as well. Silberstein said the baby remained in critical condition and “prayers are needed,” as doctors continue to fight for his life. “We are grateful to God that our son-in-law Amichai is recovering and is in relatively good condition. A miracle happened – he was shot three times, but is still in good condition,” said Chaim, adding that it was a real Chanukah miracle that Shira and Amichai survived the attack. He added that they had received prayers and messages from across the world including Prague, Canada, South Africa and Australia, and the family were truly grateful for the support. Seven people were injured during Sunday night’s terrorist attack. A manhunt for the terrorist is still underway.